Antigua, Guatemala is probably the most famous place for tourists and backpackers alike in Guatemala. It was once the capital of the country, until a volcanic eruption ruined the city and they had to move it to what is now “Guatemala city”. Antigua is a colonial style city that’s bursting in cultural, amazing views, delicious food and plenty of drinking opportunities. If you’ve always wanted to see a volcano erupt, but not be in danger, then this is the place to achieve that! Bradley and I spent 3 nights in Antigua and below we discuss some of the best things to do in Antigua (Guatemala) alongside some practical information that will help you plan your trip. Ps: 10Q is approx £1 (and 7Q is about $1) for reference of my prices below! 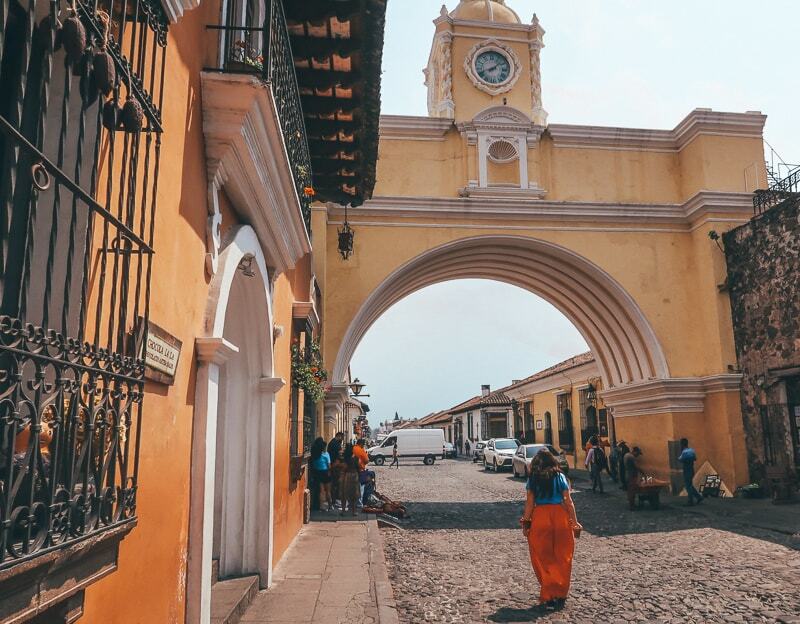 When is the best time to visit Antigua Guatemala? 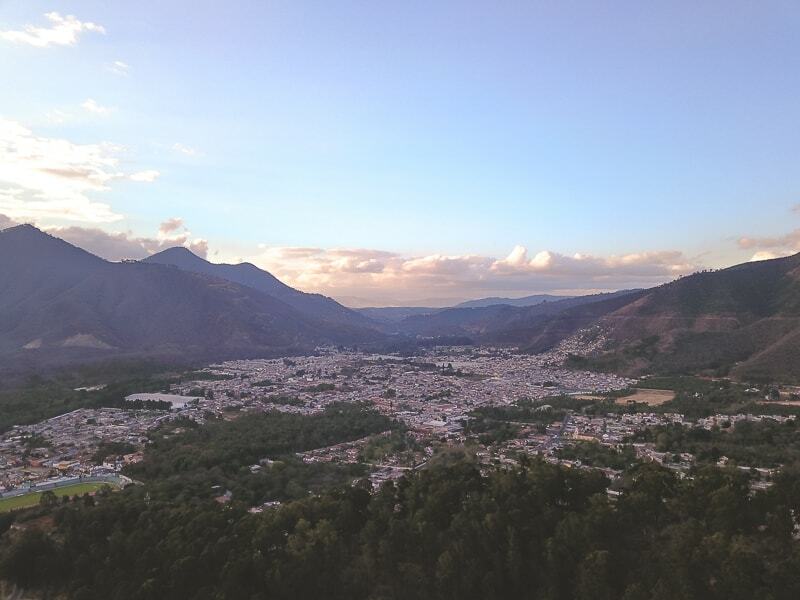 Guatemala often has a pleasant climate all year round, so you often find you can visit Antigua all year, but the dry season runs from November to April. Bradley and I visited in February and the weather was warm and pleasant with no rain. However, even in the wet season, it doesn’t tend to rain more than a few hours a day! How to get to Antigua? Guatemala in general doesn’t have the world’s best transport links by any stretch of the imagination, but getting to Antigua is fairly easy. Fly: Lots of people get flights to Guatemala city, which is only around a one hour journey and get a shuttle or taxi to Antigua from there. If you’ve booked a package with a hotel, you can most likely arrange for them to pick you up from the airport to save any hassle. Uber is also available, but I don’t know the price as we didn’t use it for that long a distance. Shuttle Bus: If you are already in Guatemala then chances are you will be getting a shuttle bus to Antigua. They run from all over the country, and we got our from Lanquin to Antigua for 140 Q, but you can get it for around 125 Q. Chicken Bus: I assume you would be able to get chicken buses from Guatemala City to Antigua, but I honestly didn’t see a lot of chicken buses on our route from Lanquin, so I’m not sure how that would work. But chicken buses don’t have air con, and they tend to be even slower, so I think it’s worth just getting an organised shuttle. It’s not expensive for what it is. I’d say the perfect amount of time to stay in Antigua would be 4-5 nights. You could easily stay longer, and if you want to do absolutely everything on the list of things to do in Antigua Guatemala, then you will probably need to stay longer. Especially if you want to hike volcanoes! Okay, let’s get right down to it, my list of the top things to do in Antigua Guatemala. Some of these things Bradley and I didn’t do, due to time constraints, but I had every intention of doing them so I did a lot of research beforehand which should be useful to you anyway. This is one of the most visited and photographed parts of Antigua and it’s become a significant religious and cultural center for the whole region. Actually, lots of the churches and convents in Antigua are a little worse for wear due to earthquakes, but many of them are still used. We stayed in an airbnb which was like minutes away from this famous hotel. 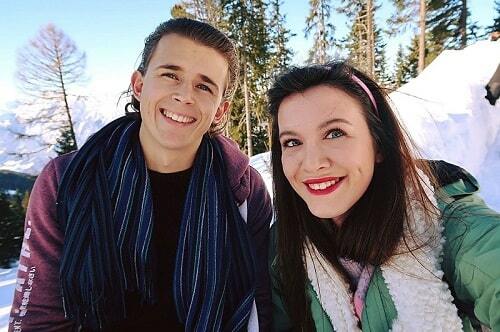 It was actually a Canadian couple who said we should definitely go visit. It’s a 5 star hotel and museum and it’s located on the grounds of the Santo Domingo Monastery which was once quite the significant and grand convent in all of the Americas. The hotel is well known for it’s baroque architecture and there are a number of treasures on display. Of course if you want the full experience, you could stay here too. Volcano Fuego in Guatemala is a very active volcano and still currently pushes out ash and lava sometimes. It’s last big eruption was last year (2018) where up to 70 people were killed. You can’t hike that volcano, but you can hike the Acatenango volcano which will give you a few of Fuego up close, and if you’re lucky, you’ll see Lava coming out. Two friends we met in Antigua managed to see Lava from the volcano and it looked bloody amazing-- I was super jealous. This volcano hike isn’t for the faint hearted or the unfit. It’s pretty much direct incline and once you get to the top, it can feel like you could topple over at any stage. It’s a two day, overnight hike. 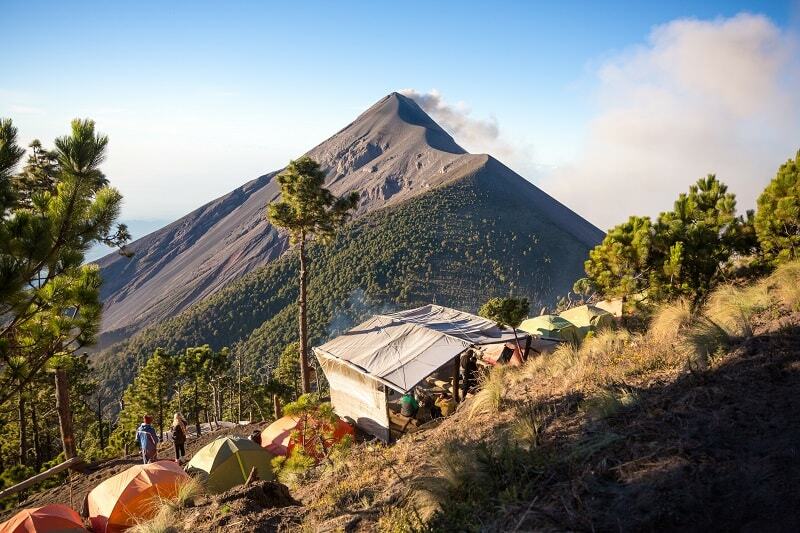 You hike up in the day, then you camp overnight and see an amazing sunrise view of Fuego, then you hike down the next day. Prices vary and I know someone who got the experience for 250Q, but others pay more such as around 350-400Q for a tad more luxury. What that basically means is they give you an air bed to sleep on instead of a mat! Your rental will include your food, your equipment and all you need for an overnight hike up a volcano. It’s truly a lifetime experience, and you should definitely go for it, if you’ve got the time, and the fitness level. This is one of the really coolest things to do in Antigua Guatemala. I mean, not everyone can say they’ve got to make smores on a volcano! So, this is an active volcano that can be climbed (to a certain extent) in Antigua. The volcano is located around an hour and fifteen minutes from Antigua and it’s an easier hike than the one above. This volcano frequently erupts, but only with ash which makes it hot enough to roast marshmallows. Lots of people do this trip with a guide as they organise the transportation and bring the marshmallows for you. It’s usually around and then you pay the entrance fee to the national park in which the volcano is contained. It’s 8,373 feet tall and it will probably take you around 2 hours to hike up and down, and due to activity at the moment, you can reach the actual peak of the volcano, but you get close enough. It’s a relatively short hike, but it is steep. If you wish you can rent walking sticks to help, or even hire a horse, up until the ash fields where they can’t enter. You will take rest stops along the way and get awesome pictures, then you will get to roast your marshmallows! You can even head to the souvenir shop after and buy a piece of lava to take home with you as a memory if you wish. You have to have a guide with you by law! Take your time when hiking and don’t feel pressured to go quick. It is a high altitude, so if you have type 1 diabetes (like me), my guide on dealing with altitude with type 1 diabetes might be of use here. You will not see LAVA! So if you are told you will, they are lying. 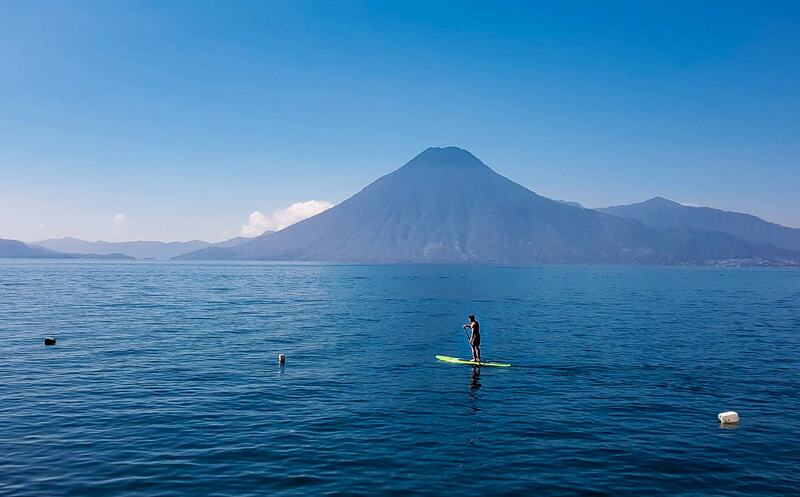 Lake Atitlan is about 2 hours and 30 minutes from Antigua, Guatemala and it feels like you’re being transported to another beautiful world. Lake Atitlan is known as the “eternal spring” because it’s always a constant temperature of 25 degrees Celsius, but due to the high level of the place, this is still very warm! About 98% of the population of people surrounding the lake are indigenous, so it’s an awesome chance to meet local people and experience different cultures. Some of the lake towns include San Pedro, and Santa Cruz. If you don’t have time to stay overnight at the lake, you can take a day trip from Antigua. There are plenty of tour organisations who will offer you a package deal that will include your transport there and back, and your lunch and transport on the lake. Or, if you want to do it alone, just book a shuttle bus there and back and explore on your own. Shuttles start at 6 am and it’s a standard cost of around 85 Q ($10). Don’t pay more than this, and if you get it for less, then even better! If you do decide to stay at Lake Atitlan, then we can recommend the Sunset Lodge for breathtaking views on the lake. This is the most iconic area and picture of Antigua. When the sky is right, you can get a picture of the arch with Volcano Fuego in the background perfectly. The sky wasn’t perfect when we were there, so I didn’t get that “iconic” picture, but I did take a picture of the arch! There are “professional” photographers there who can take your picture for you, which is cool if you don’t have a high quality camera and want a cute souvenirs. This “Hill of the cross” is only a short and easy 30 minute “hike” upwards from the centre of Antigua. It offers stunning views across the city and it’s a great place to catch the sunset. When you arrive you’ll have awesome views of the volcanoes that surround you, and there are people selling drinks and snacks. Also, you can legally fly a drone here, so it’s a good opportunity to get some AWESOME footage of the volcanos! I’d actually say this is one of the romantic things to do in Antigua. Antigua is BURSTING with bars and opportunities to drink. Alcohol is very cheap, and you can get shots of tequila (no thank you) for 5Q which is like 50 pence, and Cuba Libres for 10Q which is £1. There are lots of really cool artisan markets in Guatemala and i love a good souvenir, so that’s why it’s made the list of the best things to do in Antigua. I collect shot glasses from every country I visit, alongside travel bands, and Brad collects flag patches for his rucksack. There is a market located next to the famous arch and it has everything. Everything is quite cheap too, which is surprising for such a tourist thriving area. You can also buy little bags of Guatemalan coffee and chocolate which make great gifts for family and friends back home. Speaking of coffee, Guatemala is a rich coffee region, and it’s well known. I loved the coffee and this was one of my highlights in Antigua. So, if you love coffee as much as I do, then take a coffee tour. There are different types of tours. Try and get something authentic and in English (if you don’t speak any Spanish) so you can truly learn about the process. You’ll always get to try a delicious cup of coffee after your tour. Any travel agent in Guatemala can organise a coffee tour, but it's far cheaper to do it yourself. We visited the La Azotea it's just 10 minutes from the centre, so an uber is a couple of quid, or you can get the chicken bus for $1. Entrance is only 50 Q and includes a coffee tour, tasting and a tour of the music museum which was pretty cool! It was only Brad and I, so i was basically a private tour which was awesome and our guide was lovely. I purchased some delicious coffee at the end too. A tour company will charge you about 25 dollars, when it only costs around 7 on your own...so do it yourself and use the money you saved to buy coffee. Central Park is basically like the hub of Antigua, which I just call it the middle. It’s got lots of activity and restaurants surrounding it, and there are a few cool water fountains. Lots of people will be selling ice cream, so it’s the perfect place to sit on a bench and people watch with an ice cream, or a coffee at one of the surrounding coffee shops! Spanish is my favourite language in the world. It’s beautiful to read, write and listen too, yet I know very little. I know enough to communicate and ask questions, and I’ve taken online courses to try and learn more, but I do wish I could speak fluently. There is no better place to learn a language than the country in which it is spoken. Antigua offers lots of spanish speaking classes, so if you are there for a week or more, then try your hand at some lessons! It’s great to know another language and Spanish will be super useful to you not only in Central America, but if you find yourself backpacking South America, or Spain itself! If you’re a chocolate lover, then this will make it onto your list of things to do in Antigua, Guatemala. Not only will you learn how to make the chocolate, but you can also make it yourself! If you don’t have time to do a tour and make the chocolate yourself, you can simply skip to the visitor shop and buy some delicious chocolate to eat. This is the market of all markets in Guatemala. Chichicastenango hosts market days on Thursdays and Sundays where vendors sell handicrafts, food, flowers, pottery, wooden boxes, and much much more. 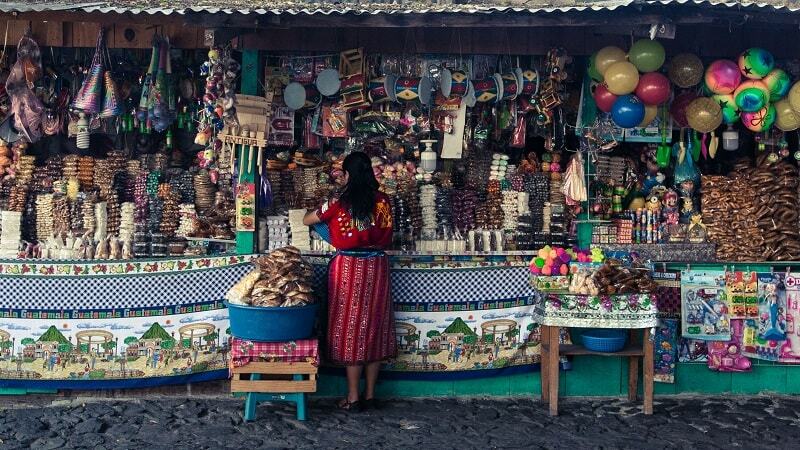 It’s one of the largest and most well known markets not only in Guatemala, but all of Central America. Again, lots of tour operators arrange day trips to the market. This isn’t something Brad and I did as basically I can’t buy anything due to space restraints and there is no point in tempting myself further. 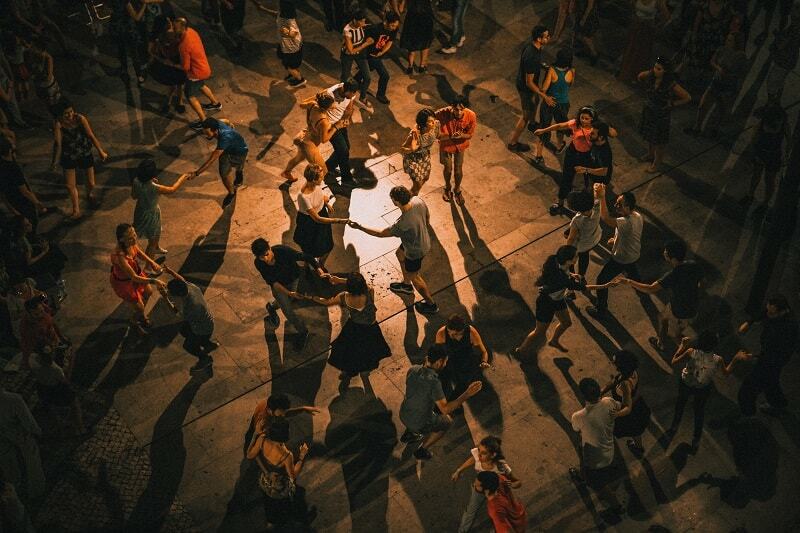 What better place to learn Salsa than in a country and oozes charm and charisma. Salsa is antigua is fun and available. You can arrange private lessons, or you can throw yourself into the deep end and just head to La Sala on a Sunday night for FREE Salsa lessons. It’s basically a night where everyone dances with everyone and teaches people the moves. It’s a lot of fun, and if you feel nervous, a couple of Margaritas will help ease your mind! 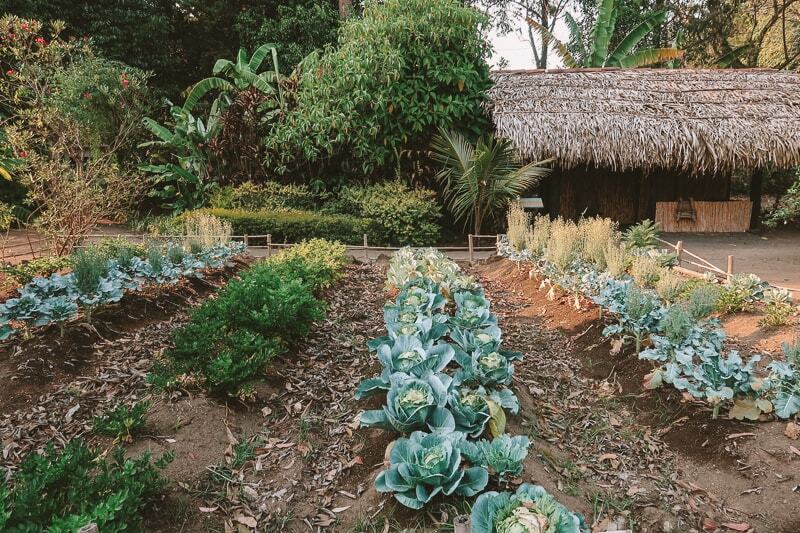 Guatemalan food is delicious and tasty, and I always think a cooking class in any country you go to is a great chance to learn a new skill and you can recreate your favourite dishes when you return back home. There are a few companies that offer cooking tours in the city, or you can book this one here. You can rent your own “car”, but not a car, like a buggy car that’s made to handle cobbled roads and head out on your own adventure. This is one of the more unique things to do in Antigua, Guatemala, and actually we saw lots of people doing it when we were there. It was another recommendation from the Canadian couple we met and they said they paid $80 for the day for the vehicle. You can fit up to 4 people in them, so I guess if you’re splitting it between 4 people, then it’s a pretty cool deal for the freedom and fun it will bring to explore the area! This is another one of the unique and cool things to do in Caoba farms. If you like organic, you’ll love this. The café serves great meals that are literally farm-to-table, there is a Farmers Market each Saturday where you can find local artisanal food and drinks, fresh produce, local crafts, and listen to live music as you shop. You can even request a tour of the farms if you’re interested. You can volunteer at the farms too which is a great chance to meet other people AND get a large bag of organic vegetables for free as payment. Hehe. This is a Roman Catholic church that was originally built in 1541 but suffered terrible earthquakes throughout history which affected the building. It was rebuilt in 1680 (ish) and it’s actually very beautiful both outside and inside. Okay, so if you don’t fancy taking a cooking class, then the next best thing is going on a cooking tour. You could easily arrange this yourself, but I actually think it’s a better experience with someone else. They can tell you details about the food and answer any questions you may have, plus they will usually know the best of the best Guatemalan food in town. This tour from get your guide looks pretty darn good! Or, these guys know what their doing and offer a wide range of different tours related to food. 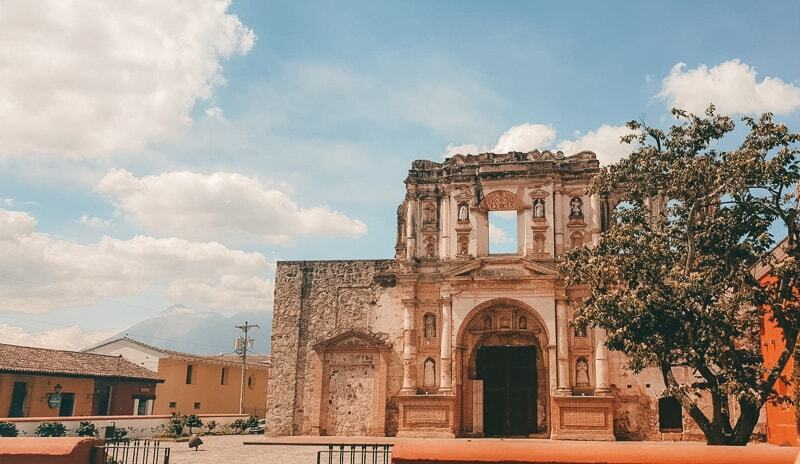 There are lots of opportunities for walking tours in Antigua, Guatemala, and it’s the perfect way to see all the highlights if you’ve only got a short amount of time to work through the list of the top things to do in Antigua Guatemala. If you want a more private experience, rather than a group tour set up, then you can probably organise a private walking tour of Antigua from a tour operator within the area. So, I hope you’ve enjoyed my list of the top things to do in Antigua Guatemala. As you can see, the place is bursting with brilliant and unique things to do, and I doubt you will ever go bored in this beautiful city. There are SO many restaurants in Antigua that it can be difficult to decide, so I thought I’d pop in our favourite restaurants and some photos of the amazing food we tried. Antigua has lots of great places to stay, and I will be doing a post on this separately, but there is literally something to suit every budget. 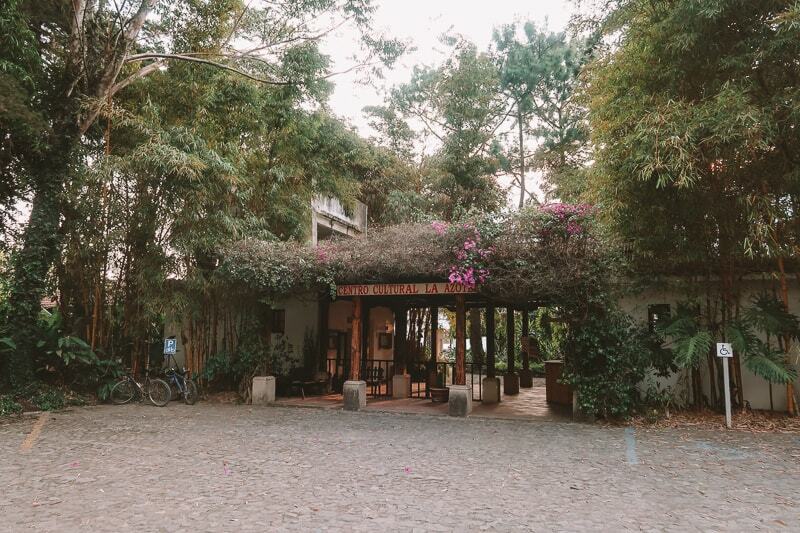 We booked one night with Casa De Leon and it was a guesthouse with a brilliant breakfast on a rooftop with a view of the volcanoes, a wonderful comfortable bed and good WiFi. It’s about a 15 minute walk to all the sights. It was a great breakfast and free! Then we used Airbnb to find an awesome colonial style house that had large rooms, free washer/dryer use, and it had a fire inside. Wonderful. You can get money off your first airbnb booking with our code here. 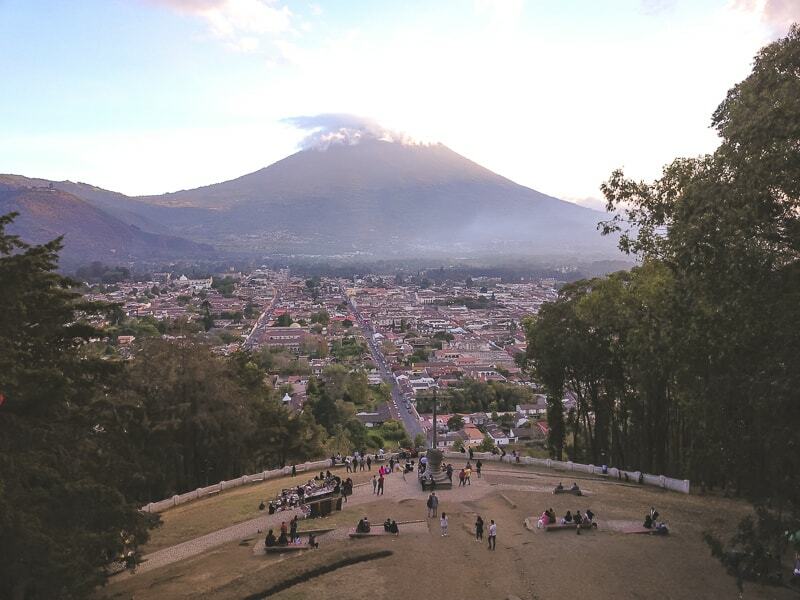 You can check out all the hotels in Antigua Guatemala here. Yes, yes and yes. Not once in our travels throughout Guatemala did I feel unsafe for a second. The people were nothing but friendly and we didn’t have any bad experiences. You need to take the usual precautions as you would in any country. Don’t put yourself in a vulnerable position. Don’t walk home alone at night (Especially if you are drunk),don’t have loads of expensive things on show, and don’t get involved in political stuff that doesn’t concern you. If you do this, you’ll have a wonderful and safe free experience in Guatemala and Antigua! Antigua is fairly cheap and really your biggest chunk of money will go on your accommodation, depending on where you have chosen to stay. Brad and I averaged at around $35 per day in Antigua because everything was so cheap, and we had a discount for our Airbnb which would have been the most expensive! A comfortable budget with tours and everything would be around $45-50 per day. 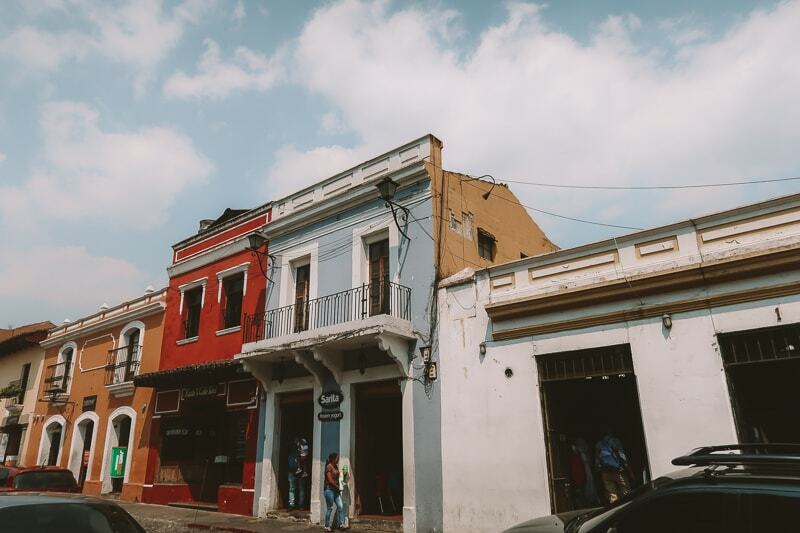 I hope you’ve enjoyed my post on the top things to do in Antigua Guatemala which kind of turned into some form of Antigua travel guide! But, hopefully you have lots of inspiration of the best places to see in Antigua Guatemala and have a great time! If you think I should add anything else to this list, this please comment below. After Antigua, make sure you visit Tikal ruins or the beautiful Flores island! Want great tours in Antigua Guatemala?